Hanson Howard Gallery will be featuring, True Stories (of a Lighter Variety), the whimsically narrative work of Sara Swink and Robert Koch this August. 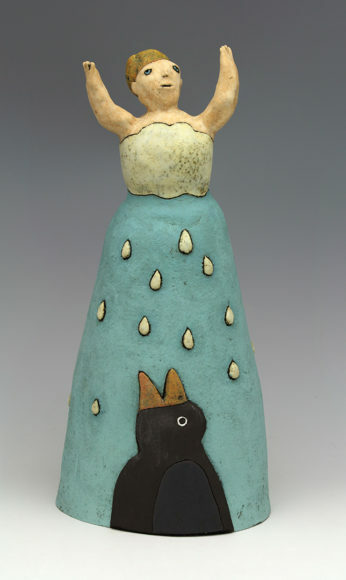 Sara Swink makes ceramic human and animal forms with a psychological stance, using form, surface, color and facial expression to investigate the imaginal realm of dreams, fantasies and emotions.Bob Koch has a playful and humorous approach to storytelling in his paintings using found snapshots as inspiration and taking the liberty to change the characters into animals. 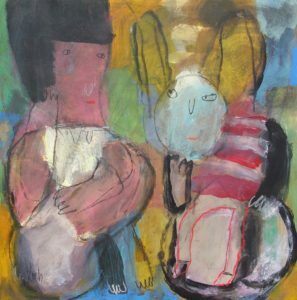 While feeling gestural and spontaneous, his paintings exhibit a strong use of composition and color. Please join us for an artist reception during Ashland’s First Friday Artwalk on August 4th, 5-8 p.m.
For Sara Swink art and dream worlds are interconnected. Both invite the unconscious to become conscious; both rely on a language of symbols open to interpretation; both contain clues about psychological patterns. Swink finds that the receptive nature of clay invites this kind of inner exploration and is the perfect medium to explore the human longing for symbolic understanding and personal regeneration. Gestural strokes and spontaneous marks collide with color blocks in Robert Koch’s narrative vignettes. Often prompted by found photographs, Koch takes the liberty to make his subjects humans or creatures inhabiting the same world. Having the appearance of quickness and even naiveté, Koch’s deft drawing skills mean each mark is playful and intentional at the sametime. For Koch, a successful painting is not only compositionally strong but also has a story to tell and if the result makes him laugh then he knows he has done what he has set out to do.